My 16-year old son and I ran (er…drove) to the grocery store this week to buy fruit and gummy bears. All in the name of art, of course. I had it in my mind that I wanted to paint whatever fresh fruit I could find in the store. We ended up with raspberries, mangos, strawberries, and a coconut. Bonus, after I set up the fruit for a photo shoot, we ate it! Yum! My son insisted on a mango, as well as a coconut purchase, where I was a bit doubtful on both. First, I am not a huge fan of mangos, but he loves them. Second, I explained, coconuts are extremely hard to open. Bah…I can do it, Mom. Huh. Okee-dokee. Coconut it is! 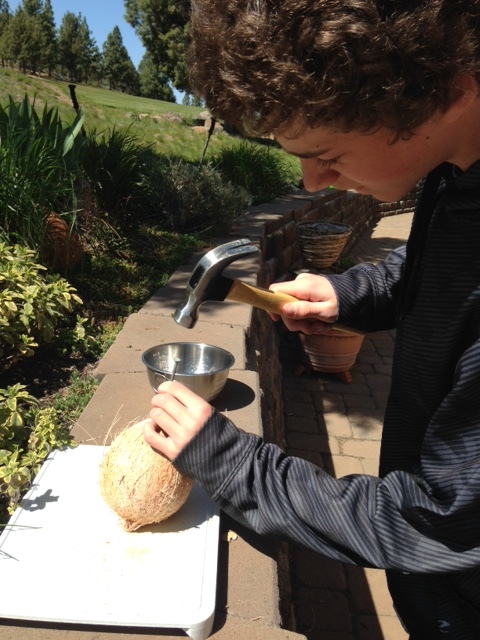 We came home and he promptly pulled up a You-Tube video on how to open a coconut, then got right to it (smarty pants). He made it look easy, like he had opened a million coconuts previously. He was pretty happy with the results, but after I set up a photo shoot, I was thrilled! Sometimes when I take photos, I know that the painting will sing. And this coconut was, quite simply, beautiful. A perfectly tussled model, his tresses spiked just so. He had interesting jagged edges, and when in contrast with white silky meat, proved to be a striking photo. And the smell? Yummy. All warmth, laced with summer sun and island breezes. 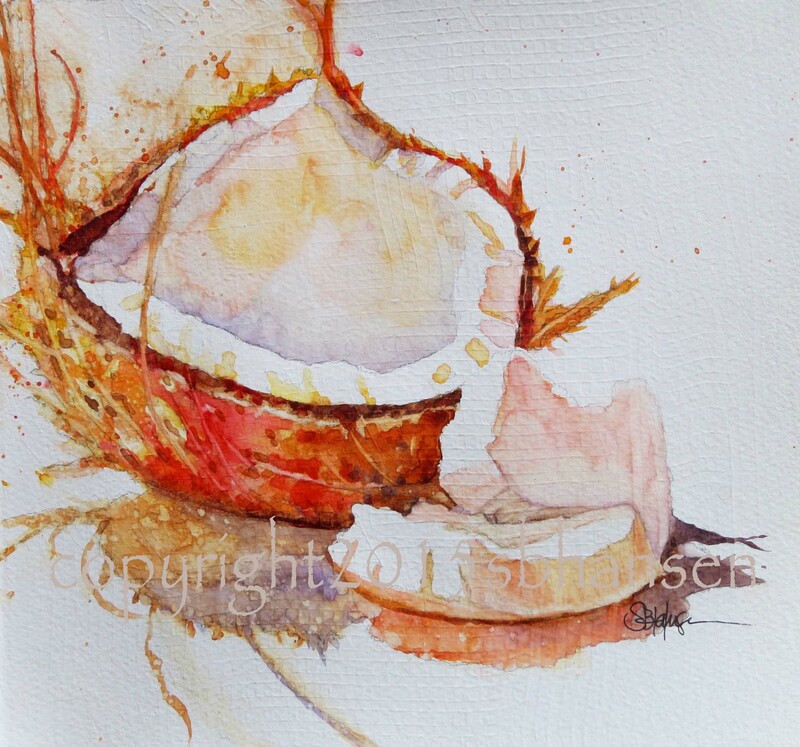 Island Coconut is one of those paintings that came together quickly and strikes the perfect tone. Doesn’t it? I love the juxtaposition of the warmth in the hairy, spiky husks against the cool, satiny-white smooth surface of the meat inside. Thanks to my son, it came about. Otherwise, I never would have bought the coconut, or, if I did, I’m not sure I could have opened it so artistically. As for the gummy bears, stay tuned! To purchase, send me an comment. I accept PayPal and will email a PayPal invoice. Shipping extra. Prints available. Please check back often, I’m working on an Etsy site for prints and should have it up soon.